Paedophryne is a genus of microhylid frogs from Papua New Guinea. All six species known so far are amongst the smallest frog and vertebrate species. Paedophryne amauensis is a recently discovered species of frog from Papua New Guinea. Only 7.7 millimetres (0.30 in) long, it is the world's smallest known vertebrate. The frog species was discovered in August of 2009 by Christopher Austin when exploring Papua New Guinea. The National Science Foundation sponsored the exploration. The frog is a millimeter smaller than the previous record holder for being the world's smallest vertebrate – a species of carp (Paedocypris progenetica) from Indonesia. The frog mainly lives on land. According to its discoverers, the life cycle of the frog does not include a tadpole stage. ↑ 1.0 1.1 1.2 Rittmeyer, Eric et al. N. (2012). "Ecological guild evolution and the discovery of the world's smallest vertebrate". PLoS ONE 7 (1). doi:10.1371/journal.pone.0029797. http://www.plosone.org/article/info%3Adoi%2F10.1371%2Fjournal.pone.0029797. Retrieved 11 January 2012. ↑ Black, Richard. 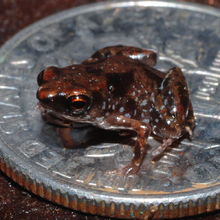 "BBC News - World's smallest frog discovered". Bbc.co.uk. Retrieved 2012-01-12. ↑ 4.0 4.1 4.2 "World's smallest creature with a vertebrate named". The Telegraph. 12 January 2012. Retrieved 12 January 2012. ↑ "Hallan en Papúa Nueva Guinea a las ranas más pequeñas del mundo" (in Spanish). eluniverso.com. Retrieved 2012-01-12. This page was last changed on 20 June 2018, at 02:00.